It’s the near future, and all women and girls across the United States are required to wear word counters that limit them to 100 words per day. For each word beyond 100, the irremovable “bracelets” deliver a series of electric shocks that increase in intensity from painful to completely devastating. What’s more, women are not permitted to read books, or write, or use sign language. They are not allowed to work outside the home. Their only purpose is to serve men as homemakers. 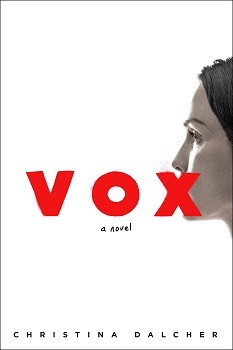 What makes Christina Dalcher’s first novel, Vox, so creepy and prescient is how normal and relatable the main characters’ lives are—and how quickly their lives change once these government edicts are enacted. Jean was a cognitive linguist studying aphasia at a Washington D.C. research facility. Patrick, her husband, works in the White House. Busy raising their three sons and one daughter, it hardly registered that Reverend Carl Cobin’s Pure Movement was taking hold across the country. To Reverend Carl and his acolytes, a return to traditional values was essential. Modern women had said too much. They needed to be silenced. Soon Reverend Carl had the ear of the president and the legislature. They gained key appointments to the courts. Boys, like Jean’s teenage son Steven, were encouraged to take AP Religious Studies, with a textbook that promoted wives’ complete obedience to their husbands. They were also recruited to join clubs that taught that women are “lesser” and not worthy of being heard. Then one day, when Jean went to apply to renew the family’s passports, she discovered that hers, and her 6-year-old daughter Sonia’s, had been revoked. Mother and daughter were fitted with slim bracelets—word counters. It didn’t take long for Jean to blithely cross the 100-word threshold—and be excruciatingly shocked. Now dinner table conversation is stilted, with mother and daughter only able to respond to simple yes/no questions. Books are kept under lock and key to prevent Sonia from learning to read. Jean’s days are filled with mind-numbing monotony and solitude. Her emotions run the gamut from fear to anger to resentment, especially toward Patrick, who goes along with every ruling without question. Then Jean is forced to return to her lab to complete her research, ostensibly to cure victims of traumatic brain injury suffering from speech loss. But she soon discovers the government has an ulterior motive, and she must use her wits and every ounce of courage to come up with a plan to thwart it.